Nigeria’s judiciary is undeniably weak. In many cases, it allows the offender to walk free while the innocent languishes in prison for crimes they know nothing about. it victimizes the poor and acquits the rich. It encourages injustice rather than justice, the case of Nnamdi Kanu - the leader of IPOB, is a clear example of the extent of the corruption and prejudice inherent in the judicial system of the lawless contraption called Nigeria. My question is, what exactly is the judiciary doing to help Nigeria get better? There are numerous cases of denial of justice of the innocent as a result of their inability to fulfil illegal financial requirements. There have been several reports of how Justice John Tsoho of the federal high court Abuja, was bribed heavily by the dictator – Buhari, to ensure he never releases Nnamdi Kanu of IPOB, but to convict him even when he had been declared innocent and acquitted. It's vivid that money influences corrupt Judges and lawyers and that their tenacious claims to be men of great academic repute is only a fraud and a guise for perpetuating evil and intimidating the weak and the innocent. A judge with integrity and without prejudice will not allow an innocent man spend time in confinement even after confirming that the accused is innocent, simply because the innocent is unable to afford bribing his way to freedom. Any judge who has the temerity to perpetrate such injustice should rather be the one to be locked up here on earth and hereafter. These set of legal practitioners should rather be considered criminals and their wicked activities, interloper. One thing I know is that truth will always triumph over lies and light, over darkness. And all those who have used their temporal privileges to intimidate, to frame and imprison innocent Biafrans and their leader - Nnamdi Kanu, must have their due rewards. Why should the case of Nnamdi Kanu and other Biafrans in detention take such a long time even after Kanu has been granted bail? If there is no evidence against an accused, why the unjust detention? Justice demands that penalty be paid for crimes committed against humanity or the state, why is Buhari walking free? Why is Buhari not convicted for treason, for toppling a democratically elected government of Shagari? Why is Buhari not convicted for killing innocent Biafran protesters on daily basis? "Why is Buhari not convicted for the illegal detention of Nnamdi Kanu, the leader of IPOB? Why is Buhari not convicted for making Nigeria ungovernable for the former president – Jonathan, by empowering the Boko Haram sect to terrorize and maim Nigerians? We have witnessed history repeat itself over and over again, how the innocent are thrown into prisons, while the guilty and the wicked move about freely in the society, in the name of immunity. We also know that due to the allegiance to certain cartels and groups, and with people in power in high places, there have been alterations to the course of justice for good men, by corrupt lawyers, police prosecutors and judges like injustice John Tsoho. The power of the judiciary is to interpret law and protect the interest of the common man. It is the arm of government that is independent and with enormous powers to guarantee justice. The judiciary is the custodian of justice and has the same capability like the executive and the legislature in promoting development through ensuring justice. If proper checks and balances are maintained, if corrupt politicians and Buhari are dealt with according to law without fear or favour, there will be great improvement in the judicial system. The constitution of a country is supreme, nobody is above it and all must be subject to it. All must be governed within the tenets of the law. Many people in Nigeria feel that they have arrived to a state of constitutional independence, that the law is no longer for them and that they are above the law. Such absurd feelings should never be allowed to possess their minds in the first place, let alone having them act on such feelings. Who on earth can be above the law? There’s absolutely, no one. I foresee a time when all those whose conduct and pride is in complete disharmony with Biafrans’ fundamental human rights, when all those in position of trust to protect the integrity of the constitution but betrayed it, when all those who have carefully denied innocent Biafrans justice, will be brought to book. Biafra will one day surprise the entire world by prosecuting the true offenders, Biafra will one day confiscate the properties of all corrupt politicians and judges who have acquired ill-gotten wealth at the expense of the Biafran people. Nigeria will one day cease to be the giant of Africa in matters of justice and anti-corruption. It is a place where men and women go unpunished after committing crimes, simply because they are wealthy and influential in the society. It is only when judges are corrupt, that evil, wickedness and injustice reaches its peak. A complete overhaul of the judicial system is necessary. The judiciary should take its rightful place as a strong force and an independent arm of governance, maintaining justice and equity. Let the righteous men take over the judiciary, men who are above prejudice, whose Interest is not the filthy lucre, men who can without fear or favour, demonstrate the power of law as an instrument of maintaining justice and equity. Judiciary in Nigeria needs to be strengthened, to be a strong institution that is not controlled by the rich. The growing inequality and injustice in Nigeria against the Indigenous People of Biafra and its leader Nnamdi Kanu, can be reduced by a strong, independent and committed judiciary that pursues integrity and that is void of prejudice. 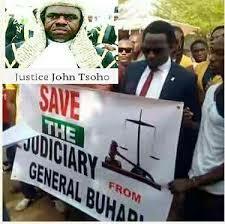 Corrupt lawyers and judges like John Tsoho, should be ostracized from the justice system. Obsolete laws should be reviewed, treaties ratified by Nigeria that protects human rights should be domesticated, and coherent judicial policies should be established and scrupulously checked continually.